These are running shoes made of PU leather with an LED illuminated rubber sole. 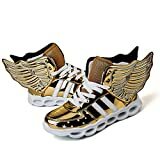 They are breathable, lightweight and durable and feature shiny and classy wings that can be disassembled. The lights are turned on with a hidden button located beside the charging port which is also used to change the lighting mode. Furthermore, the sole is waterproof and can therefore be used for running, jogging and other light activities without any damage to the LED lights. They are rechargeable with a USB cable. Designed and manufactured with synthetic materials, these Puma kids’ shoes are lightweight and ideal for athletic activities. They are equipped with LED lights on the sole which makes them fashionable and encourage your kids to stay on their feet longer. The sole is made of rubber to provide maximum traction for running or jogging and are waterproof to protect the rechargeable LED lights. Made from synthetic and fabric materials, these Carter’s girl shoes are adorable and come with a light feature on the sole. The sole is made of synthetic rubber which is durable, waterproof and provides maximum traction. Designed for athletic activities, the LED lights provide a fashionable illumination that encourages kids to play, run or jog helping keep them physically fit and healthy. 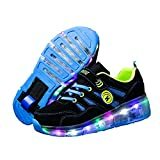 These sneakers have been designed for boys and feature light-up LED lights. They are comfortable and lightweight with a padded collar, a round toe and a cushioned midsole which encourages your kids to move around more. Moreover, these shoes feature a puff-print design which compliments the LED lights making these shoes look classy and fashionable. The hook-and-loop closure with bungee laces provides for comfortable and secure fitting. With 7 Colors of LED lights these shoes are classy and are a perfect gift idea. The LED lights are imbedded on the rubber sole which is waterproof and has a charging port. The lights are activated using a button nest to the charging port and each press of the button changes the light mode. They are comfortable, lightweight and durable with excellent traction for use in a variety of light occasions. Designed with flying woven fabric, these light-up shoes are classy and stylish ideal for dancing or other light activities. They can display up to 7 different colors with changing patterns which not only illuminate but create an ambience for sports dancing. Moreover, the LED lights are rechargeable with a single charge delivering up to 11 hours of illumination. They are embedded in the lantern rubber sole, which is not only durable but also provides excellent traction with a comfortable ride. Made with PU leather and synthetic materials these light-up shoes are lightweight and ideal for light activities. They feature a cushioned insole for added comfort and a synthetic outsole which not only provides traction but also houses the LED lights. The LED lights are USB rechargeable with a single charge offering up to 6 hours of illumination. Stylish and elegant, these light-up shoes bring the fun out of kids’ activities. They are made of PU leather which is lightweight, durable and comfortable. Apart from the illuminating LED lights, these shoes also feature low profile wheels making these shoes ideal for multiple functions such as skating or dancing. The synthetic sole provides a no-slip grip and also houses the LED lights. Designed for boys, these shoes are made with fabric and synthetic materials. They are lightweight, durable and comfortable for a large number of activities with the LED lights providing a colorful illumination that adds to more fun for the kids. These shoes have synthetic sole, providing an excellent traction as well as housing the LED lights in a waterproof enclosure for durability. These shoes are made of synthetic and fabric materials that are highly durable and of premium quality. Its sole is non-marking and is made of rubber, which provides traction and houses the illuminating LED lights. These shoes are lightweight, flexible and durable and can used for a number of light activities with the LED lights providing a colorful illumination to add to the fun. Make your kids’ activities more fun with these top 10 best light-up shoes for kids in 2019. Whether it is running, jogging, dancing or even walking, these light-up shoes provide an additional motivation that will make them go an extra mile. 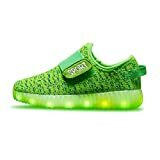 Moreover, these shoes are comfortable, lightweight and durable with the LEDs being rechargeable to provide extended periods of fun and excitement for your kids.